The ZCatalog is Zope’s built in search engine. It allows you to categorize and search all kinds of Zope objects. You can also use it to search external data such as relational data, files, and remote web pages. In addition to searching you can use the ZCatalog to organize collections of objects. The ZCatalog supports a rich query interface. You can perform full text searching, can search multiple indexes at once, and can even specify weighing for different fields in your results. In addition, the ZCatalog keeps track of meta-data about indexed objects. Cataloging a large collection of objects all at once. Cataloging objects as they are created and tracking changes made to them. Creating a web interface to search the ZCatalog. Choose ZCatalog from the product add list to create a ZCatalog object within a subfolder named ‘Zoo’. This takes you to the ZCatalog add form, as shown in the figure below. The Add form asks you for an Id and a Title. Give your ZCatalog the Id ‘AnimalCatalog’ and click Add to create your new ZCatalog. The ZCatalog icon looks like a folder with a small magnifying glass on it. 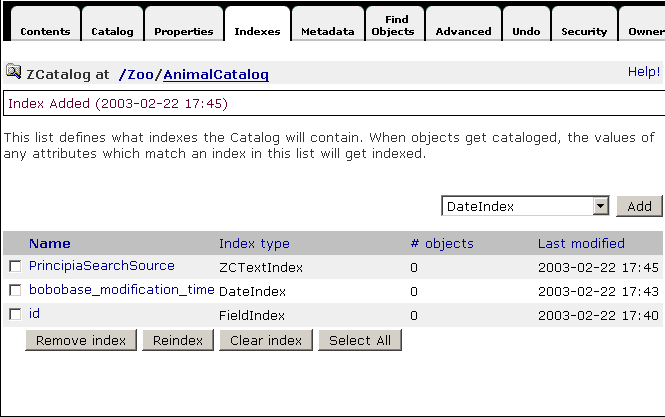 Select the AnimalCatalog icon to see the Contents view of the ZCatalog. A ZCatalog looks a lot like a folder, but it has a few more tabs. Six tabs on the ZCatalog are the exact same six tabs you find on a standard folder. ZCatalog have the following views: Contents, Catalog, Properties, Indexes, Metadata, Find Objects, Advanced, Undo, Security, and Ownership. When you click on a ZCatalog, you are on the Contents view. Here, you can add new objects and the ZCatalog will contain them just as any folder does. Although a ZCatalog is like a normal Zope folder, this does not imply that the objects contained within it are automatically searchable. A ZCatalog can catalog objects at any level of your site, and it needs to be told exactly which ones to index. In order to tell Zope what to catalog and where to store the information, we need to create a Lexicon and an Index. A Lexicon is necessary to provide word storage services for full-text searching, and an Index is the object which stores the data necessary to perform fast searching. Now we can create an index that will record the information we want to have in the ZCatalog. Click on the Indexes tab of the ZCatalog. A drop down menu lists the available indexes. 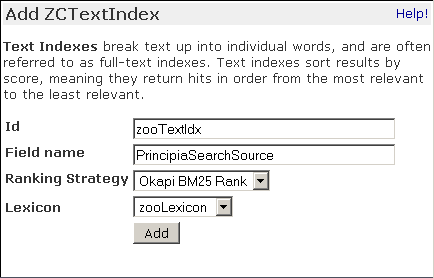 Choose ZCTextIndex; in the add form fill in the id zooTextIdx. Fill in PrincipiaSearchSource in the “Field name” input. This tells the ZCTextIndex to index the body text of the DTML Documents (PrincipiaSearchSource is an API method of all DTML Document and Method objects). Note that zooLexicon is preselected in the Lexicon menu. When you want the textindex to work on other types of objects, they have to provide a method named “PrincipiaSearchSource” which returns the data of the object which has to be searched. To keep this example short we will skip over some of the options presented here. In the section on indexes below, we will discuss this more thoroughly. 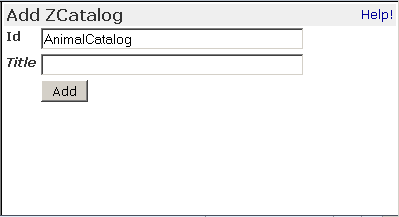 Additionally, we will have to tell the ZCatalog which attributes of each cataloged object that it should store directly. These attributes are called Metadata, however they should not be confused with the idea of metadata in Zope CMF, Plone, or other content management systems–here, this just means that these are attributes that will be stored directly in the catalog for performance benefits. For now, just go to the Metadata tab of the ZCatalog and add id and title. Now that you have created a ZCatalog and an Index, you can move onto the next step: finding objects and cataloging them. Suppose you have a zoo site with information about animals. To work with these examples, create two DTML Documents along-side the AnimalCatalog object (within the same folder that contains the AnimalCatalog ZCatalog) that contain information about reptiles and amphibians. rump, creating a much larger and more intimidating head. Visitors to your Zoo want to be able to search for information on the Zoo’s animals. Eager herpetologists want to know if you have their favorite snake, so you should provide them with the ability to search for certain words and show all the documents that contain those words. Searching is one of the most useful and common web activities. The AnimalCatalog ZCatalog you created can catalog all of the documents in your Zope site and let your users search for specific words. To catalog your documents, go to the AnimalCatalog ZCatalog and click on the Find Objects tab. In this view, you tell the ZCatalog what kind of objects you are interested in. You want to catalog all DTML Documents so select DTML Document from the Find objects of type multiple selection and click Find and Catalog. The ZCatalog will now start from the folder where it is located and search for all DTML Documents. It will search the folder and then descend down into all of the sub-folders and their sub-folders. For example, if your ZCatalog is located at ‘/Zoo/AnimalCatalog’, then the ‘/Zoo’ folder and all its subfolders will get searched. If you have lots and lots of objects, this may take a long time to complete, so be patient. After a period of time, the ZCatalog will take you to the Catalog view automatically, with a status message telling you what it just did. Below the status information is a list of objects that are cataloged, they are all DTML Documents. To confirm that these are the objects you are interested in, you can click on them to visit them. Viewing an object in the catalog shows you what was indexed for the object, and what metadata items are stored for it. You have completed the first step of searching your objects, cataloging them into a ZCatalog. Now your documents are in the ZCatalog’s database. Now you can move onto the fourth step, creating a web page and result form to query the ZCatalog. To create search and report forms, make sure you are inside the AnimalCatalog ZCatalog and select Z Search Interface from the add list. Select the AnimalCatalog ZCatalog as the searchable object, as shown in the figure below. Name the Report Id “SearchResults”, the Search Input Id “SearchForm”, select “Generate Page Templates” and click Add. This will create two new Page Templates in the AnimalCatalog ZCatalog named SeachForm and SearchResults. These objects are contained in the ZCatalog, but they are not cataloged by the ZCatalog. The AnimalCatalog has only cataloged DTML Documents. 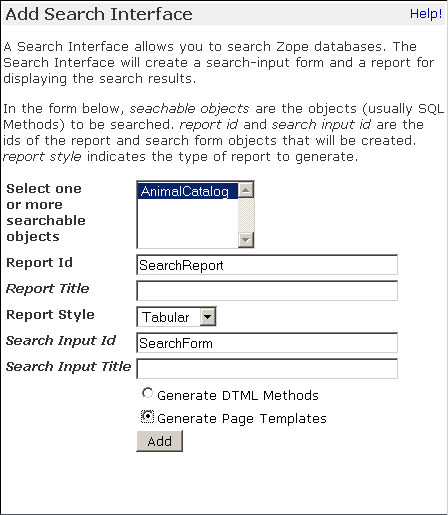 The search Form and Report templates are just a user interface to search the animal documents in the ZCatalog. You can verify this by noting that the search and report forms are not listed in the Cataloged Objects tab. To search the AnimalCatalog ZCatalog, select the SearchForm template and click on its Test tab. By typing words into the ZooTextIdx form element you can search all of the documents cataloged by the AnimalCatalog ZCatalog. For example, type in the word “Reptiles”. The AnimalCatalog ZCatalog will be searched and return a simple table of objects that have the word “Reptiles” in them. The search results should include the carpet python. You can also try specifying multiple search terms like “reptiles OR amphibians”. Search results for this query should include both the Chilean four-eyed Frog and the carpet python. Congratulations, you have successfully created a ZCatalog, cataloged content into it and searched it through the web. The ZCatalog is capable of much more powerful and complex searches than the one you just performed. Let’s take a look at how the ZCatalog stores information. This will help you tailor your ZCatalogs to provide the sort of searching you want. ZCatalogs store information about objects and their contents in fast databases called indexes. Indexes can store and retrieve large volumes of information very quickly. You can create different kinds of indexes that remember different kinds of information about your objects. For example, you could have one index that remembers the text content of DTML Documents, and another index that remembers any objects that have a specific property. When you search a ZCatalog you are not searching through your objects one by one. That would take far too much time if you had a lot of objects. Before you search a ZCatalog, it looks at your objects and remembers whatever you tell it to remember about them. This process is called indexing. From then on, you can search for certain criteria and the ZCatalog will return objects that match the criteria you provide. The word Python appears on three pages. Zope indexes work like this except that they map the search term, in this case the word Python, to a list of all the objects that contain it, instead of a list of pages in a book. Each index has a name, like PrincipiaSearchSource, and a type, like ZCTextIndex. Searches text. Use this kind of index when you want a full-text search. Searches objects for specific values. Use this kind of index when you want to search objects, numbers, or specific strings. Searches collections of specific values. This index is like a FieldIndex, but it allows you to search collections rather than single values. Searches for all objects that contain certain URL path elements. For example, you could search for all the objects whose paths begin with ‘/Zoo/Animals’. Searches among FilteredSets; each set contains the document IDs of documents which match the set’s filter expression. Use this kind of index to optimize frequently-accessed searches. A subclass of FieldIndex, optimized for date-time values. Use this index for any field known to be a date or a date-time. Searches objects based on a pair of dates / date-times. Use this index to search for objects which are “current” or “in effect” at a given time. Old version of a full-text index. Only provided for backward compatibility, use ZCTextIndex instead. We’ll examine these different indexes more closely later in the chapter. New indexes can be created from the Indexes view of a ZCatalog. There, you can enter the name and select a type for your new index. This creates a new empty index in the ZCatalog. To populate this index with information, you need to go to the Advanced view and click the the Update Catalog button. Recataloging your content may take a while if you have lots of cataloged objects. For a ZCTextIndex, you will also need a ZCTextIndex Lexicon object in your ZCatalog - see below for details. To remove an index from a ZCatalog, select the Indexes and click on the Delete button. This will delete the index and all of its indexed content. As usual, this operation is undoable. The ZCatalog can not only index information about your object, but it can also store information about your object in a tabular database called the Metadata Table. The Metadata Table works similarly to a relational database table, it consists of one or more columns that define the schema of the table. The table is filled with rows of information about cataloged objects. These rows can contain information about cataloged objects that you want to store in the table. Your meta data columns don’t need to match your ZCatalog’s indexes. Indexes allow you to search; meta-data allows you to report search results. The Metadata Table is useful for generating search reports. It keeps track of information about objects that goes on your report forms. For example, if you create a Metadata Table column called Title, then your report forms can use this information to show the titles of your objects that are returned in search results instead of requiring that you actually obtain the object to show its title. To add a new Metadata Table column, type in the name of the column on the Metadata Table view and click Add. To remove a column from the Metadata Table, select the column check box and click on the Delete button. This will delete the column and all of its content for each row. As usual, this operation is undoable. Next let’s look more closely at how to search a ZCatalog. While metadata columns are useful, there are performance tradeoffs from using too many. As more metadata columns are added, the catalog itself becomes larger (and slower), and getting the result objects becomes more memory- and performance-intensive. Therefore, you should choose metadata columns only for those fields that you’ll want to show on common search results. Consider carefully before adding a field that returns a large result (like the full text of a document) to metadata. You can search a ZCatalog by passing it search terms. These search terms describe what you are looking for in one or more indexes. The ZCatalog can glean this information from the web request, or you can pass this information explicitly from DTML or Python. In response to a search request, a ZCatalog will return a list of records corresponding to the cataloged objects that match the search terms. 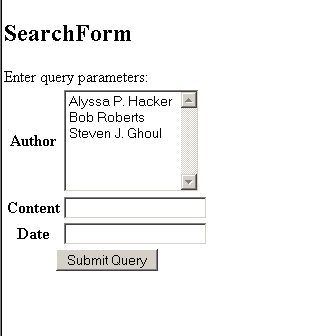 In this chapter you used the Z Search Interface to automatically build a Form/Action pair to query a ZCatalog (the Form/Action pattern is discussed in the chapter entitled Advanced Page Templates ). The Z Search Interface builds a very simple form and a very simple report. These two methods are a good place to start understanding how ZCatalogs are queried and how you can customize and extend your search interface. This calls the ‘NewsCatalog’ ZCatalog. Notice how the form parameters from the search form ( ‘contentTextIdx’ , ‘author’, ‘date’ ) are not mentioned here at all. Zope automatically makes sure that the query parameters from the search form are given to the ZCatalog. All you have to do is make sure the report form calls the ZCatalog. Zope locates the search terms in the web request and passes them to the ZCatalog. The ZCatalog returns a sequence of Record Objects (just like ZSQL Methods). These record objects correspond to search hits, which are objects that match the search criteria you typed in. For a record to match a search, it must match all criteria for each specified index. So if you enter an author and some search terms for the contents, the ZCatalog will only return records that match both the author and the contents. ZSQL Record objects have an attribute for every column in the database table. Record objects for ZCatalogs work very similarly, except that a ZCatalog Record object has an attribute for every column in the Metadata Table. In fact, the purpose of the Metadata Table is to define the schema for the Record objects that ZCatalog queries return. Page Templates make querying a ZCatalog from a form very simple. For the most part, Page Templates will automatically make sure your search parameters are passed properly to the ZCatalog.
""" Returns news relevant to the current folder's id """
This template assumes that you have defined ‘absolute_url’ and ‘title’ as Metadata columns in the ‘NewsCatalog’. Now, when you are in a particular section, the sidebar will show a simple list of links to news items that contain the id of the current animal section you are viewing. (Note: in reality, you shouldn’t use an index called ‘absolute_url’, but should rely instead on the getURL() method call below, as that works even in virtual hosting settings. Returns true if the result object has a meta-data element named key. Returns the physical path of the result object. This can be used to uniquely identify each object if some kind of post-processing is performed. Returns the URL of the result object. You should use this instead of creating a metadata element for ‘absolute_url’, This can differ from getPath() if you are using virtual hosting. Returns the actual Zope object from the result object. This is useful if you want to examine or show an attribute or method of the object that isn’t in the metadata–once we have the actual object, we can get any normal attribute or method of it. However, be careful not to use this instead of defining metadata. Metadata, being stored in the catalog, is pre-calculated and quickly accessed; getting the same type of information by using ‘getObject().attribute_name’ requires actually pulling your real object from the ZODB and may be a good deal slower. On the other hand, stuffing everything you might ever need into metadata will slow down all querying of your catalog, so you’ll want to strike a balance. A good idea is to list in metadata those things that would normally appear on a tabular search results form; other things that might be needed less commonly (and for fewer result objects at a time) can be retried with getObject. Returns the Catalog’s record id for the result object. This is an implementation detail, and is not useful except for advanced uses. Earlier you saw that the ZCatalog includes eight types of indexes. Let’s examine these indexes more closely, and look at some of the additional available indexes, to understand what they are good for and how to search them. A ZCTextIndex is used to index text. After indexing, you can search the index for objects that contain certain words. ZCTextIndexes support a rich search grammar for doing more advanced searches than just looking for a word. which would search for occurences of “word1” but would exclude documents which contain “word2”. A sequence of words without operators implies AND. A search for “carpet python snakes” translates to “carpet AND python AND snakes”. This will return objects containing “word1” and “word2” or just objects that contain the term “word3”. which returns all words that begin with “Zop” and have one more character - just like in a Un*x shell. Note though that wild cards cannot be at the beginning of a search phrase. “?ope” is an illegal search term and will be ignored. will return all objects that contain the terms “bob” and “uncle” but will not include any objects that contain words that start with “Zoo” like “Zoologist”, “Zoology”, or “Zoo” itself. snakes OR frogs -"carpet python"
will return all objects which contain the word “snakes” or “frogs” but do not contain the phrase “carpet python”.
""" Returns relevant, non-catastropic news """
ZCTextIndexes are very powerful. When mixed with the Automatic Cataloging pattern described later in the chapter, they give you the ability to automatically full-text search all of your objects as you create and edit them. In addition, below, we’ll talk about TextIndexNG indexes, which are a competing index type that can be added to Zope, and offers even more additional features for full-text indexing. Lexicons are used by ZCTextIndexes. Lexicons process and store the words from the text and help in processing queries. Often you want search terms to be case insensitive, eg. a search for “python”, “Python” and “pYTHON” should return the same results. The lexicons’ Case Normalizer does exactly that. Stop words are words that are very common in a given language and should be removed from the index. They would only cause bloat in the index and add little information. In addition, stop words, being common words, would appear in almost every page, without this option turned on, a user searching for “the python house” would get back practically every single document on the site (since they would all likely contain “the”), taking longer and adding no quality to their results. A splitter parses text into words. Different texts have different needs of word splitting - if you are going to process HTML documents, you might want to use the HTML aware splitter which effectively removes HTML tags. On the other hand, if you are going to index plain text documents about HTML, you don’t want to remove HTML tags - people might want to look them up. Also, an eg. chinese language document has a different concept of words and you might want to use a different splitter. The Lexicon uses a pipeline architecture. This makes it possible to mix and match pipeline components. For instance, you could implement a different splitting strategy for your language and use this pipeline element in conjunction with the standard text processing elements. Implementing a pipeline element is out of the scope of this book; for examples of implementing and registering a pipeline element see eg. ‘Products.ZCTextIndex.Lexicon.py’. A pipeline element should conform to the ‘IPipelineElement’ interface. To create a ZCTextIndex, you first have to create a Lexicon object. Multiple ZCTextIndexes can share the same lexicon. FieldIndexes have a different aims than ZCTextIndexes. A ZCTextIndex will treat the value it finds in your object, for example the contents of a News Item, like text. This means that it breaks the text up into words and indexes all the individual words. A FieldIndex does not break up the value it finds. Instead, it indexes the entire value it finds. This is very useful for tracking object attributes that contain simple values, such as numbers or short string identifiers. In the news item example, you created a FieldIndex ‘author’. With the existing search form, this field is not very useful. Unless you know exactly the name of the author you are looking for, you will not get any results. It would be better to be able to select from a list of all the unique authors indexed by the author index. In this example, you are changing the form element ‘author’ from just a simple text box to an HTML multiple select box. This box contains a unique list of all the authors that are indexed in the ‘author’ FieldIndex. When the form gets submitted, the select box will contain the exact value of an authors name, and thus match against one or more of the news objects. Your search form should look now like the figure below. Be careful if you catalog objects with many different values; you can easily end up with a form with a thousand items in the drop-down menu. Also, items must match exactly, so strings that differ in capitalization will be considered different. That’s it. You can continue to extend this search form using HTML form elements to be as complex as you’d like. In the next section, we’ll show you how to use the next kind of index, keyword indexes. A KeywordIndex indexes a sequence of keywords for objects and can be queried for any objects that have one or more of those keywords. Suppose that you have a number of Image objects that have a ‘keywords’ property. The ‘keywords’ property is a lines property that lists the relevant keywords for a given Image, for example, “Portraits”, “19th Century”, and “Women” for a picture of Queen Victoria. The keywords provide a way of categorizing Images. Each Image can belong in one or more categories depending on its ‘keywords’ property. For example, the portrait of Queen Victoria belongs to three categories and can thus be found by searching for any of the three terms. You can use a Keyword index to search the ‘keywords’ property. Define a Keyword index with the name ‘keywords’ on your ZCatalog. Then catalog your Images. Now you should be able to find all the Images that are portraits by creating a search form and searching for “Portraits” in the ‘keywords’ field. You can also find all pictures that represent 19th Century subjects by searching for “19th Century”. It’s important to realize that the same Image can be in more than one category. This gives you much more flexibility in searching and categorizing your objects than you get with a FieldIndex. Using a FieldIndex your portrait of Queen Victoria can only be categorized one way. Using a KeywordIndex it can be categorized a couple different ways. Using this search form you can provide users with a range of valid search terms. You can select as many keywords as you want and Zope will find all the Images that match one or more of your selected keywords. Not only can each object have several indexed terms, but you can provide several search terms and find all objects that have one or more of those values. Path indexes allow you to search for objects based on their location in Zope. Suppose you have an object whose path is ‘/zoo/animals/Africa/tiger.doc’. You can find this object with the path queries: ‘/zoo’, or ‘/zoo/animals’, or ‘/zoo/animals/Africa’. In other words, a path index allows you to find objects within a given folder (and below). This query searches a ZCatalog for all images that are located within the ‘/Zoo/Lizards’ folder and below. It creates a link to each image. To make this work, you will have to create a FieldIndex ‘meta_type’ and a Metadata entries for ‘title’. Depending on how you choose to arrange objects in your site, you may find that a path indexes are more or less effective. If you locate objects without regard to their subject (for example, if objects are mostly located in user “home” folders) then path indexes may be of limited value. In these cases, key word and field indexes will be more useful. DateIndexes work like FieldIndexes, but are optimised for DateTime values. To minimize resource usage, DateIndexes have a resolution of one minute, which is considerably lower than the resolution of DateTime values. DateIndexes are used just like FieldIndexes; below in the section on “Advanced Searching with Records” we present an example of searching them. DateRangeIndexes are specialised for searching for ranges of DateTime values. An example application would be NewsItems which have two DateTime attributes ‘effective’ and ‘expiration’, and which should only be published if the current date would fall somewhere in between these two date values. Like DateIndexes, DateRangeIndexes have a resolution of one minute. DateRangeIndexes are widely used in CMF and Plone, where content is compared to an effective date and an expiration date. DateRangeIndexes also allow one or both of the boundary dates of the indexed objects to be left open which greatly simplifies application logic when querying for “active” content where expiration and effective dates are optional. A TopicIndex is a container for so-called FilteredSets. A FilteredSet consists of an expression and a set of internal ZCatalog document identifiers that represent a pre-calculated result list for performance reasons. Instead of executing the same query on a ZCatalog multiple times it is much faster to use a TopicIndex instead. TopicIndexes are also useful for indexing boolean attributes or attributes where only one value is queried for. They can do this more efficiently then a field index. Building up FilteredSets happens on the fly when objects are cataloged and uncatalogued. Every indexed object is evaluated against the expressions of every FilteredSet. An object is added to a FilteredSet if the expression with the object evaluates to True. Uncatalogued objects are removed from the FilteredSet. A built-in type of FilteredSet is the PythonFilteredSet - it would be possible to construct custom types though. A PythonFilteredSet evaluates using the eval() function inside the context of the FilteredSet class. The object to be indexes must be referenced inside the expression using “o.”. Below are some examples of expressions. Provided our ‘AnimalCatalog’ contains a TopicIndex ‘topicindex’, this would return all folderish objects in ‘AnimalCatalog’ which had a non-empty title. TopicIndexes also support the ‘operator’ parameter with Records. More on Records below. A more advanced feature is the ability to query indexes more precisely using record objects. Record objects contain information about how to query an index. Records are Python objects with attributes, or mappings. Different indexes support different record attributes. Note that you don’t have to use record-style queries unless you need the features introduced by them: you can continue to use traditional queries, as demonstrated above. A record style query involves passing a record (or dictionary) to the catalog instead of a simple query string. The second query matches objects that have both the keywords “big” and “shiny”. Without using the record syntax you can only match objects that are big or shiny. Searches for all objects with values larger than the minimum of the values passed in the ‘query’ parameter. Searches for all objects with values smaller than the maximum of the values passed in the ‘query’ parameter. Searches for all objects with values smaller than the maximum of the values passed in the ‘query’ parameter and larger than the minimum of the values passwd in the ‘query’ parameter. This query matches all objects in the AnimalCatalog which have a population count greater than 5 (provided that there is a FieldIndex ‘population_count’ and an attribute ‘population_count’ present). The path level to begin searching at. Level defaults to 0, which means searching from the root. A level of -1 means start from anywhere in the path. You can use the level attribute to flexibly search different parts of the path. As of Zope 2.4.1, you can also include level information in a search without using a record. Simply use a tuple containing the query and the level. Here’s an example tuple: ‘(“/aa/bb”, 1)’. Defines a range search on a DateIndex (optional, default: not set). As an example, we go back to the NewsItems we created in the Section Searching with Forms. For this example, we created news items with attributes ‘content’, ‘author’, and ‘date’. Additionally, we created a search form and a report template for viewing search results. Searching for dates of NewsItems was not very comfortable though - we had to type in exact dates to match a document. DateRangeIndexes only support the ‘query’ attribute on Record objects. The ‘query’ attribute results in the same functionality as querying directly; returning matches where the date supplied to the query falls between the start and end dates from the indexed object. Because ZCTextIndex operators are embedded in the query string, there are no additional Record Attributes for ZCTextIndexes. For more information on creating records in HTML see the section “Passing Parameters to Scripts” in Chapter 14, Advanced Zope Scripting. Automatic Cataloging is an advanced ZCatalog usage pattern that keeps objects up to date as they are changed. It requires that as objects are created, changed, and destroyed, they are automatically tracked by a ZCatalog. This usually involves the objects notifying the ZCatalog when they are created, changed, or deleted. This usage pattern has a number of advantages in comparison to mass cataloging. Mass cataloging is simple but has drawbacks. The total amount of content you can index in one transaction is equivalent to the amount of free virtual memory available to the Zope process, plus the amount of temporary storage the system has. In other words, the more content you want to index all at once, the better your computer hardware has to be. Mass cataloging works well for indexing up to a few thousand objects, but beyond that automatic indexing works much better. If you can trade off memory for time, you can enable ‘Subtransactions’ in the ‘Advanced’ tab of the catalog. This commits the work in chunks, reducing memory requirements, but taking longer. It is a good solution for mass cataloging with a very large number of records. Another major advantage of automatic cataloging is that it can handle objects that change. As objects evolve and change, the index information is always current, even for rapidly changing information sources like message boards. On the other hand, cataloging a complex object when it changes may be too time consuming during operation (especially if the catalog index attempts to translate the information, as TextIndexNG, described below, can do with PDF files or Microsoft Office files). Some sites may benefit from mass cataloging, and having a cron job or other scheduled job initiate the mass cataloging every night. In standard (non-CMF, non-Plone) Zope, none of the built-in object types attempt to automatically catalog themselves. In CMF and Plone, the “contentish” object (Documents, News Item, Event, etc.) all use automatic cataloging to add themselves to the standard CMF catalog, ‘portal_catalog’. The CMF and especially Plone offer many advantages; if you’re interested in building a content-oriented site, you should consider these technologies. If your query contains no text index fields, your results will not be sorted in any particular order. For example, with a query based off a KeywordIndex, or query based off both a KeywordIndex and a DateIndex, you will get a indeterminate ordering. Okapi: is the best general choice. It does very well when comparing an ordinary “human query” against a longer text field. For example, querying a long description field for a short query like ‘indoor OR mammal’ would work very well. Cosine: is better suited for when the length of the query comes close to matching the length of the field itself. This can be, however, very inefficient. When results are returned by the ZCatalog, they are in a special form called a LazyResults set. This means that Zope hasn’t gone to the trouble of actually creating the entire list, but has just sketched out the list and will fill it in at the exact point that you ask for each item. This is helpful, since it lets you query the catalog for a result set with 10,000 items without Zope having to really construct a 10,000 item long list of results. However, when we try to sort this, Zope will have to actually create this list since it can’t rely on it’s lazy, just-in-time method. Normally, you’ll only show the first 20 or 50 or so of a result set, so sorting 10,000 items just to show the first 20 is a waste of time and memory. Instead, we can ask the catalog to do the sorting for us, saving both time and space. first 20 or 50 or so items, we can give a hint to the ZCatalog not to bother to sort beyond this by passing along a ‘sort_limit’ parameter, which is the number of records to sort. This gives us all records with the ‘title’ “frog”, sorted by ‘latin_name’, and doesn’t bother to sort after the first 20 records. "A Critique of 'Tora! Tora! Tora!'" This is a necessary and positive step to make the index use less storage and less memory, and increases search results, as your site user doesn’t have to worry about getting incidental words (“the”, “a”, etc.) correct, nor about capitalization, etc. Note: As we’ll see, TextIndexNG indexes can even do advanced tricks, such as normalizing a word and stemming it, so that a search for “vehicles” could find “vehicle” or even “car”. However, this process means that the index no longer knows the actual value, and, therefore, can’t sort on it. Due to this, it is not possible to use the ‘sort_on’ feature with text indexes types. To work around this, you can either sort the results of the query using the normal python ‘sort()’ feature (shown above), or you can create an additional non-text index on the field, described below, in the section ‘Indexing a Field with Two Index Types’. Similarly, the API call ‘uniqueValuesFor’, described above, cannot be used on text-type indexes, since the exact values are not kept. This query finds all sunset art by Van Gogh: both of these conditions must be true. This method, however, does not remove duplicates, so a painting of a sunset by VanGogh would appear twice. For alternate strategies about searching in two places, see ‘PrincipiaSearchSource’ and ‘FieldedTextIndex’, below, both of which can be used as possible workarounds. Since the different indexes act differently, it can be advantageous to have the same attribute indexed by more than one index. For example, our animals have a ‘latin_name’ attribute that gives their formal genus/species latin name. A user should be able to search that trying to match a name exactly, and we should be able to sort results based on that, both of which suggest a FieldIndex. In addition, though, users may want to search that like a text field, where they can match parts of words, in which case we would a ZCTextIndex (or TextIndexNG, described below). In a case like this, a good strategy is to create one index for the FieldIndex on ‘latin_name’. Let’s call that index ‘latin_name’. Then, you can create a ZCTextIndex that uses a new feature: the ability to have the indexed attribute be different than the index name itself. When you create the second index, the ZCTextIndex, you can give it the Id ‘latin_name_text’, and have the ‘Indexed attributes’ field be ‘latin_name’. Now, when we catalog our animals, their ‘latin_name’ attribute is indexed in two ways: once, as a FieldIndex, that we can sort against and match exactly, and once as a ZCTextIndex, that we can search like a text field with full text search. You can choose to create indexes on any attribute or method that you would find useful to search on; however, one that is generally helpful is ‘PrincipiaSearchSource’. Several of the built-in Zope objects, such as DTMLDocuments, and many add-on objects to Zope have a ‘PrincipiaSearchSource’ attribute or method that returns a value that is meant to be used for general purpose searching. Traditionally, ‘PrincipiaSearchSource’ would include the text in an object’s title, it’s body, and anywhere else you’d want to be able to search. "used for general searching for animal"
So that, if you create a ‘PrincipiaSearchSource’ index and search again that, you can find this animal by using words that are in it’s ‘title’, ‘latin_name’, ‘description’, or ‘environment’, without having to worry about which field, exactly, they’re in. This is similar to searching with a web search engine, in that you use can use a single text string to find the “right” information, without needing to know about the type of object you’re looking for. It is especially helpful in allowing you to create a site-wide search: searching animals specifically by their ‘latin_name’ or ‘environment’ might be useful for a biologist in the right section of your site, but for a general purpose visitor, they might like to search using the phrase “jungle” and find results without having to know to search for that in the ‘environment’ field of a search form. If you create custom types by using more advanced techniques described elsewhere, you should create a PrincipiaSearchSource method that returns appropriate object-wide text searching capabilities. The CMF was built from the ground up to understand the difference between things that are “content”, such as a news item or press release, and those things that are not, such as a DTMLMethod used to show a press release, or a ZCatalog object. In addition, the CMF includes several stock items that are intended to be used for content, including: Document, Event, NewsItem, and others. These content items are already set up for autocataloging, so that any changes made will appear in the catalog. In non-CMF Zope, the traditional name for a general-purpose catalog is ‘Catalog’ (though you can always create your own catalog with any id you want; we’ve used the example ‘AnimalCatalog’ in this chapter for a special-purpose catalog for searching animal-specific info in our zoo.) Even though ‘Catalog’ is the traditional name, Zope does not come with such a catalog in the ZODB already, you have to create it. In CMF (and Plone, an out-of-the-box portal system built on top of the CMF), there is always a catalog created, called ‘portal_catalog’, at the root of the CMF site. All of the built-in content objects (and almost every add-on content object for the CMF/Plone) are set to autocatalog to this ‘portal_catalog’. This is required, since many of the features of the CMF and Plone, such as listing current content, finding content of correct types, etc., rely on the ‘portal_catalog’ and the searching techniques shown here to function. In CMF and Plone, the index name ‘PrincipiaSearchSource’ is not traditionally used. Instead, an index is created called ‘SearchableText’, and used in the same manner as ‘PrincipiaSearchSource’. All of the standard contentish objects have a ‘SearchableText’ method that returns things like title, description, body, etc., so that they can be general-text searched. If your attribute value isn’t plain text, TextIndexNG can convert it to text to index it. This will allow you to store, for instance, a PDF file in Zope and be able to search the text of that PDF file. Current formats it can convert are: HTML, PDF, Postscript, Word, Powerpoint, and OpenOffice. Reduces words to a stem (removes verb endings and plural-endings), so a user can search for “car” and get “car” and “cars”, without having to try the search twice. It knows how to perform stemming in 13 different languages. Can find words that are “similar” to your words, based on the Levenshtein algorithm. Essentially, this measures the distance between two terms using indicators such as how many letters differ from one to another. Can look for words that are near each other. For example, a search for “Zope near Book” would find results where these words were close to each other in the document. Rather than having only one way to express a query, TextIndexNG uses a “pluggable” architecture where a Python programmers can create new parsers. For example, to find a document that includes the word “snake” but not the word “python”, you’d search for “snake andnot python” in the default parser. However, given your users expectations (and native language), they might prefer to say “snake and not python” or “snake -python” or such. TextIndexNG comes with three different parsers: a rich, default one, a simple one that is suitable for more general serarching, and a German one that uses german-language words (“nicht” for “not”, for example). Although writing a new parser is an advanced task, it would be possible for you to do so if you wanted to let users express the question in a different form. You can customize the list of “stop words” that are too common to both indexing or search for. You can use a “wildcard” to search for part of a word, such as “doc*” to find all words starting with “doc”. Unlike ZCTextIndex, you can also use wildcards are the start of a word, such as “*doc” to find all words ending with “doc”, as well. Removing accented characters so that users can search for an accented word without getting the accents exactly right. This optional feature allows you to get better search results when some of the query terms could not be found. In this case, it uses a similarity matching to “expand” the query term to find more matches. Sorting of results based on their word frequencies, similar to the sorting capabilities of ZCTextIndex. TextIndexNG is an excellent replacement for ZCTextIndex, especially if you have non-English language documents or expect to have users that will want to use a rich query syntax. Full information on TextIndexNG is available at https://pypi.org/project/Products.TextIndexNG3/. FieldedTextIndex is a new index type that is not (yet) a standard part of Zope, but is a separate product that can be installed and used with a standard catalog. Often, a site will have a combined field (normally ‘PrincipiaSearchSource’ or ‘SearchableText’, as described above) for site-wide searching, and individual fields for more content-aware searching, such as the indexes on ‘latin_name’, ‘environment’, etc. Since it’s slows down performance to concatenate catalog result sets directly, the best strategy for searching across many fields is often use the ‘PrincipiaSearchSource’/’SearchableText’ strategy of a single text index. However, this can be too limiting, as sometimes users want to search in several fields at once, rather than in all. FieldedTextIndex solves these problems by extending the standard ZCTextIndex so that it can receive and index the textual data of an object’s field attributes as a mapping of field names to field text. The index itself performs the aggregation of the fielded data and allows queries to be performed across all fields (like a standard text index) or any subset of the fields which have been encountered in the objects indexed. However, you have to search this all at once–you can’t opt to search just ‘title’ and ‘latin_name’, unless you created separate indexes for these fields. Creating separate indexes for these fields is a waste of space and memory, though, as the same information is indexed several times. In this second example, only ‘title’ and ‘latin_name’ will be searched. In addition, FieldedTextIndexes support weighing, so that different fields “weigh” more in the query weigh, and a match in that field influences the results so that it appears earlier in the result list. For example, in our zoo, matching part of an animals ‘latin_name’ should count very highly, matching part of the ‘title’ should count highly, and matching part of the description should count less so. This is a very powerful feature for building a comprehensive search strategy for a site, since it lets us control the results to better give the user what they probaby want, rather than returning documents based solely on how many times their search word appears. The examples given here are for searching a FieldedIndex using PythonScripts, however they can be searched directly from the REQUEST in a form like other fields. Since a FieldedTextIndex can act just like a normal ZCTextIndex if queried with just a search string, yet offer additional features above and beyond the normal ZCTextIndex, it’s a good idea to use this for any text index where you’d concatenate more than one attribute or method result together, such as for ‘SearchableText’ or ‘PrincipiaSearchSource’. FieldedTextIndex can be downloaded at http://old.zope.org/Members/Caseman/FieldedTextIndex/folder_contents. Full documentation on how to create this type of index, and further information on how to search it, including how to search it from web forms, is available in the README file that comes with this product. The cataloging features of ZCatalog allow you to search your objects for certain attributes very quickly. This can be very useful for sites with lots of content that many people need to be able to search in an efficient manner. Searching the ZCatalog works a lot like searching a relational database, except that the searching is more object-oriented. Not all data models are object-oriented however, so in some cases you will want to use the ZCatalog, but in other cases you may want to use a relational database. The next chapter goes into more details about how Zope works with relational databases, and how you can use relational data as objects in Zope.